Are you getting married this holiday season? Or maybe even next? Need some helpful ideas of what is appropriate to wear for your big day? Well you are in luck, we have a few helpul hints and ideas for you and your big day. When it comes to a winter wedding what is more important then the dress?!?! The dress is already what most people look forward to seeing on the big day, but when it comes to a winter wedding it becomes even more exciting. Every season plays a big part in what you are going to be wearing, if its summer you don’t want to be too hot and in the fall you might need a little bolero to keep you warm. But the winter weddings can almost be the most fun, because it seems like you can glam everything up just a little to make it sparkle!!! 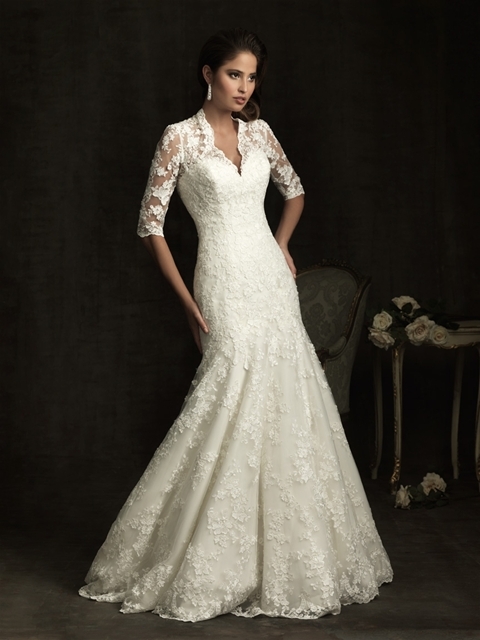 A reminiscent of Kate Middleton’s royal wedding gown, the full sleeves and high neckline of the dress offers maximum coverage and a little extra warmth. A knee-length hemlines can be winter appropriate if the dress is fashioned from a weightier textile, such as silk mikado. A cozy bolero adds an extra dose of warmth. If your wedding is taking place in a warmer location, you can still play up the dress for the season by choosing a gown with a seasonal flair. Such as a more champagne color dress, and maybe even more ballgown style. Just because you are getting married somewhere warm doesn’t mean you have to give up your dream of looking like a princess on your big day. A tulle-skirted ballgown that features a structured bodice fashioned form silk wool- a heavier textile that will keep you warm. With this style of dress you could also style it up with a more silky bolero with longer sleeves. A few other ideas to make your wedding dress have a little more seasonal flavor is adding a fun and seasonal wrap to a simple strapless dress. Any dress even if it as a little bit of a cap sleeve you can add a stylish bolero to bring a frosty look to your winter wedding gown. The last tip is the crystal, crystal can add sparkle to anything, and after all it is a winter wedding so what better then a little crystal to make it look like falling snow. With all these ideas finding the perfect winter wedding dress should be as easy as enjoying those delicious holiday treats. I hope all of you have a wonderful Christmas with all your loved ones, and have a very happy New Year. Reminiscent of Kate Middleton’s Royal Wedding Gown!!! This entry was posted in Bridesmaid Shopping, Wedding Attire and Fashion by Affairs by Brittany. Bookmark the permalink.